Schmidt Structural Products, Oaks, PA, is a modular storage system for long goods, coils and flat stock. Transportable and adaptable, it is designed to store long material lengths in capacities from 2 to 5 tons and to 10 units high. It also can help increase usable facility floor space and avoid material loss or damage due to excessive handling. The HF system also can be used to stack coils in capacities from 5 to 30 tons and coil diameters to 72 in., providing an economical alternative to typical floor storage of coil or rolled materials. The HF system consists of a spreader-beam unit and stacking cradles. The spreader-beam unit attaches to an existing facility crane. 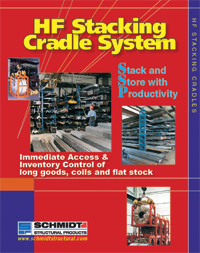 Designed with built-in hooks for engagement of the cradles, this unit provides simple access to stack and sort inventory stored in the HF system cradles. A single unit can be used to handle three different lengths of material or it can be used to handle multiple cradle rows.